Many patients are content with their progress following a non-operative treatment plan. Patients who have been unable to regain lost motion and strengthen the surrounding muscles sufficiently may need a rotator cuff repair. This is often the case for the younger, more active patients who want to address continued weakness following physical therapy. 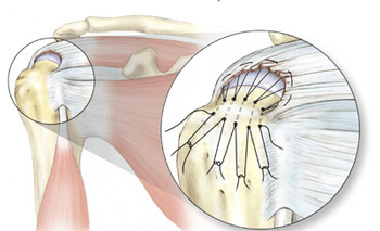 Rotator cuff repairs can be performed either arthroscopically or with open incisions. Complication rates after surgery are generally low. Infection tends to occur a little less often when arthroscopic techniques are used. Risks of major bleeding or nerve damage are extremely small. Postoperative stiffness is the major complication of both impingement and rotator cuff tears. Incisions must be kept dry for two or three days after surgery. If you have stitches they are usually removed 10 - 12 days after surgery.